CTA just posted an RFP for up to (45) Low Floor, (40) Foot, All-Electric Transit Buses and the Design-Build and Installation of up to (13) En-Route Charging Stations and Associated Spare Parts. This is one of those procurements where the specifications are on CD, so we won't find out anything on the website. You'll have to ask Maria Biszewski, although being in the IT business, you'll be hard pressed to find a computer that can read them. If one wants to really go down this road, one could ask why it isn't on a thumb drive. Press release says late 2018 delivery. That Press Release also says "CTA will purchase an additional 20-30 all-electric buses in 2018." BTW, I had said that I thought CTA was giving the feds the business in saying that the electric buses will replace 17 year old polluting buses in 2019, but now it looks like it will be the case. Hmm up to 45 sounds like alot. Must be an option for 15 cause they state 25-30 are coming in 2018. Now I question this RFP. If it is indeed an RFP how can they state a late 2018 arrival for the buses if a manufacturer has yet to sign on the dotted line? En route charging stations sound good and all, but if #700 was involved in a garage fire at a charging station who will put out a fire at the en route charging station? I wonder if there's such a thing as a en route charging station with fire extinguishing equipment that can automatically try to put out a fire like a sprinkler system, foam system or something? I don't know if up to 70 buses (both procurement contracts) are enough to retire the #6400's, but if routes like #54A and #205 bite the dust, they might be able to retire the fleet cause the fleet count will fall at fg and np. It takes a year roughly to manufacture new buses unless they piggyback an existing contract. That's really the only way they can say x amount of time cause a firm contract exists. If the airlines are so worried about batteries combusting the FAA is considering banning them on commercial flights then there must be something to battery combustion. Bad thing about it is soon it will be in most cars. Definitely taking the fire coverage insurance if I get one. Better not get brakes or tires, either, as one or the other caused a fire on 4333. Now I question this RFP. If it is indeed an RFP how can they state a late 2018 arrival for the buses if a manufacturer has yet to sign on the dotted line? Rereading the press release, you made me respond to a red herring. The press release says "CTA will purchase an additional 20-30 all-electric buses in 2018" It does not say that they will be delivered in 2018. I deleted my two responses. I'm baffled by the "en-route charging stations". Does that mean the buses might need recharging during a run or does it mean charging up at the terminals? I think the distinction is from the current CTA situation, where the chargers are in the garages. In descriptions of other operations, such as using Proterra buses, the chargers are at layover points. The buses can "top off" in 10 minutes, as opposed to CTA buses having to go back to the garage after reaching their range of about 85 miles.The battery capacity (whether 85 or 125 miles) is not affected by the manor of charging. For instance, if electric buses are put on 124, a charger could be put in the Union Station Transit Center. The Proterra site description of both methods is here. Maybe they changed this one. They hadn't from when I quoted it 6 hours ago. OK, that makes sense, but even a 10 minute top off is going to cause delays if the bus is late to the layover, as so many are. To clarify, the press release said that the 25 Novas are coming in late 2018. The new electric buses are also noted as part of "Rahm's plan for all the buses to be new, despite the fact that they are counting 12 year old NFs as new". They also note the previous Nova purchases, 100 articulated buses, the rehabs, and the two (now one I guess) electric buses. Well TCMetro sure thinks he read it the way I saw it. As he pointed out, he didn't. You mixed up the Novas with the electrics. At least I admitted that you led me astray, as well as in the other topic that I missed the Nova agenda item. That's a good point. Looks like the bus needs adequate recovery time in its schedule, has to run on less than full charge, or will become perpetually late. The original Proterra materials referred to a small downtown shuttle, where the 10 minute layover was no big deal. Obviously, the issue is different on the usual Chicago bus route. On your point about replacing remaining 6400s, the elimination of #54A and #205 would mainly effect FG as FG operates more runs on #205 than NP does. NP's looks to handle trips on that route more as rush hour and school trips. FG does most of the rest. A combination of future Novas and electrics would still make a dent in what's left of the 6400s though. And yeah we know it's a definite through the existing Nova contract on next year's purchase because the press release gave the mayor the chance to get out in front of another CTA announcement. 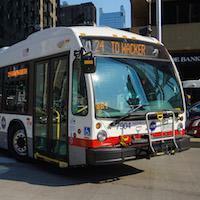 I guess cta is going back to 15 year old buses. They claim a rehab buys them 6 years so with the nf rehab they should make it 18 years. Dont know how they expect an 17 year old nova bus unrehabbed to make it but in a way they are better than the new buses. What bus would you take out on a 100 degree day? When they do the #1000 replacement it will probably be nf unless they want A six year contract. No one can do 1000 buses in 3 years that I know off. That's about a bus a day. They could do two different manufacturers like the tmc and flxible orders in 1990. They got some sort of rehab. You missed several thngs here. They have to be competitively bid. If you are making a capacity argument in favor of NF, the 2017 budget says some NFs will have to be rehabbed again, due to capital funding constraints. Finally, the feds don't allow 6 year bus contacts. So how can they deliver? That would disqualify them from bidding. No it wouldn't. First, your delivery schedule is flawed (as I noted above with respect to some 1000s getting a second rehab). Second, CTA would have the option that it used in 1990 and NY MTA uses now--split the order among manufacturers. Any specification that said 1000 buses in 3 (or even 5) years would undoubtedly be protested.